Surin Islands diving. Popular with liveaboard diving boats. The sea around the Surin Islands in southern Thailand is crystal clear and turquoise in colour. Due to the distance from any civilisation, there is almost no pollution in the environment, and therefore the corals are healthy which enables reef life to flourish. There are lots of resident species which spend their whole lives here, as well as some pelagic species which visit to hunt, breed or be cleaned. This truly is an underwater oasis, and it can be enjoyed by new & experienced scuba divers as well as those who just like to snorkel. Richelieu Rock is technically & geographically within the Mu Ko Surin National Marine Park, it is a submerged pinnacle with no beach and very little to see within 5 metres of the surface. This text is about the Surin Islands, which have beaches, flora, fauna and human settlements. There are several diving sites around The Surin Islands, with Ko Torinla being the most popular. Not many boats come just here to dive, because day trip & liveaboard diving boats need to come past the better dive sites to reach the Surin Islands. Therefore, almost every diving boat here is combining diving at Surin with other dive sites, most notably Richelieu Rock. In general, the dive sites are nice, but not spectacular. They are also relatively easy to dive, due to the protected bays. Unlike some areas of the Similans, most reefs around The Surin Islands are in very shallow water, and are protected from winds, waves and even currents. The mangroves are perfect nurseries for many fish species, including small sharks. This means that snorkelling here is very popular. The remote location ensures that pollution is kept to a minimum and the reefs are not overcrowded because visiting the area is at least a whole-day trip and sometimes longer. In general, snorkelling trips to the Surin Islands don’t offer scuba diving. However, most diving trips welcome non-diving guests who pay a lower rate and can enjoy some wonderful snorkelling. The problem is that the itineraries focus on diving, meaning that snorkellers need to fit in with that, which can be frustrating. The Surin Islands aren’t just for spending time in the water. There are other activities to enjoy there, which include visiting local communities and looking for birds, mammals and reptiles. Everyone who enters the park must pay an entry fee, and scuba divers have to pay an extra fee per day. Those who come to snorkel or stay on the land do not need to pay the diving fee. There are two local villages which are home to about 150 Moken people in total on the islands. Some scuba diving liveaboard trips often visit these villages to break up the time they spend at sea. Although the local people are quite used to foreigners and their gadgets, they are still very much islanders. Their way of life is very traditional, and for generations they have lived off of the land and sea. Not all of the effects from tourism are beneficial, but there are certain rules and procedures that visitors must adhere to so that the island way of life can continue unspoilt. Coming to the Surin Islands is not just about what creatures you can see in the crystal clear sea. There are plenty of interesting mammals, birds and reptiles which live here and almost nowhere else. Also, several species of migratory birds come and go during the year. In particular, the Nicobar Pigeon (Caloenas nicobarica) & the Sunda Flying Lemur (Galeopterus variegatus) are popular attractions for birdwatchers and mammal enthusiasts. Is There Accommodation on The Surin Islands? There are some government-run tents and bungalows on the northern of the two main Surin Islands. Booking to stay there needs to be done through specific local travel agents who work with the national park authorities. The bungalows are very simple, and the rates are reasonable. This wonderful group of 5 mostly-uninhabited islands just inside Thailand very near to the Burmese border is home to a community of local people and several species that live almost nowhere else. However, most people come to see what they can find underwater in the clear & warm sea. Snorkellers tend to come on day trips from Ranong or the northern parts of Phang Nga Province. 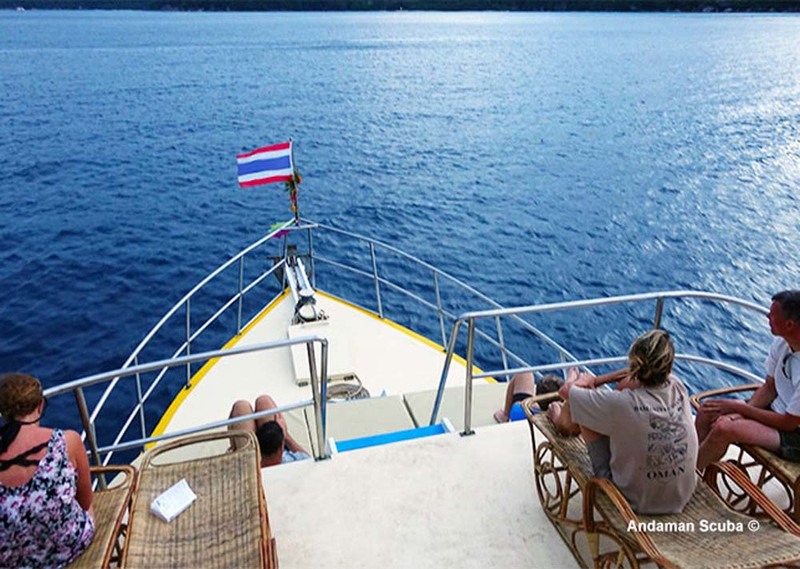 Scuba divers who visit The Surin Islands are usually doing so as part of a scuba diving liveaboard trip that could be four days in length or more.